“Rapid Fire” and “Musket” are words that you do not normally see together. For the sake of a challenge, I’ve been working into my Saturday shoots a “speed round”, where I see how many shots I can get off in a minute. So far only two I am sad to say, but I am creeping closer to three the more I practice. One primary thing to point out here. He does NOT have bullets in the cartridge. My experience its that you can’t throw a ball in the cartridge THAT fast down the barrel. The ramrod is called a ramrod because there is ramming involved. It takes a little more than just gravity to work to get a ball down the barrel. Keeping this in mind, I’ve reduced the ball size so I can more rapidly seat the bullet in the barrel. This means that I can leave the bullet in the cartridge without fear of jamming. I’ve moved from my standard .69 cal to my pistol cal of .57. This reduces my accuracy but increases my rate of fire. Now back to the video. I am IMPRESSED with his ability to rapidly return the ramrod back into the musket. This by far is my most challenging aspect of rapid fire. The hole is small, and if you rush it, you just burn seconds. Why return the ramrod you ask? If you leave it behind during a battle, then all you are left with is a fancy Pike. 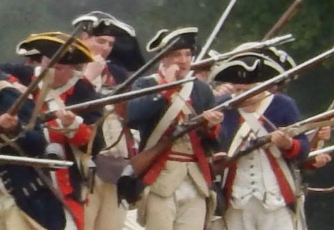 18th Century soldiers were trained to return the ramrod. Tomorrow I will try my hand at rapid fire once again. I start with an unloaded musket. I am not sure if the first shot of a pre-loaded musket would count toward the rate of fire. Please comment below if you know. I am leaving the bayonet off for this exercise. I have left it on in the past. The blade actually does help guide my loading, but inevitably I end up cutting my hand. Its just not worth it. I use a mouse for a living–I know, First World Problems. I’ll try to get some video tomorrow. Improving my rate of fire will take time. Like any sport, it is really all about muscle memory and focus. Eventually I want to be able to make a video with proof of three shots a minute. Maybe I’ll actually hit the target, but lets just focus on one thing at a time shall we? Shot four times. 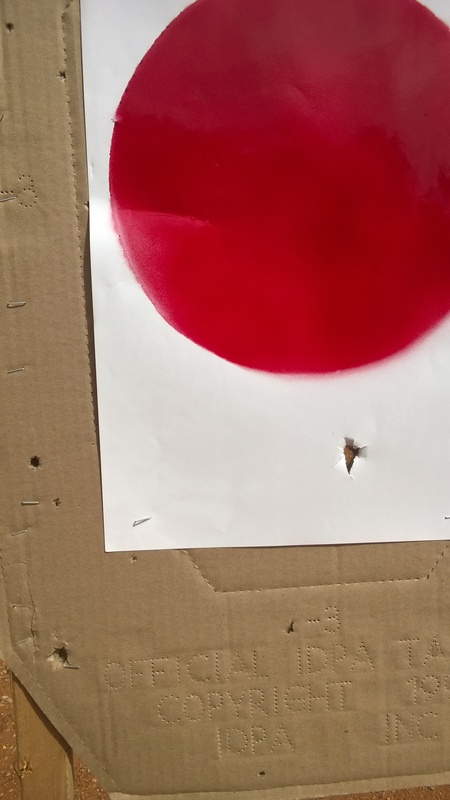 Hit paper twice at 50 yards. Again, this was with a smaller calibre, so accuracy was not the goal. 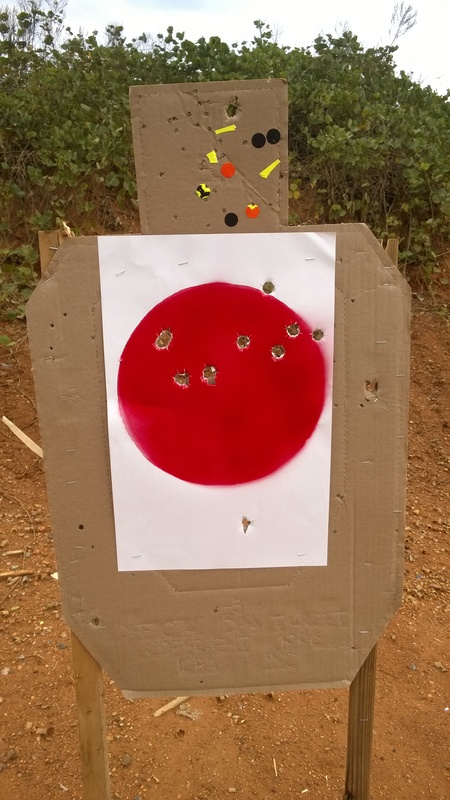 This was my grouping at 50 yards after taking my time and using .69 calibre bullets.